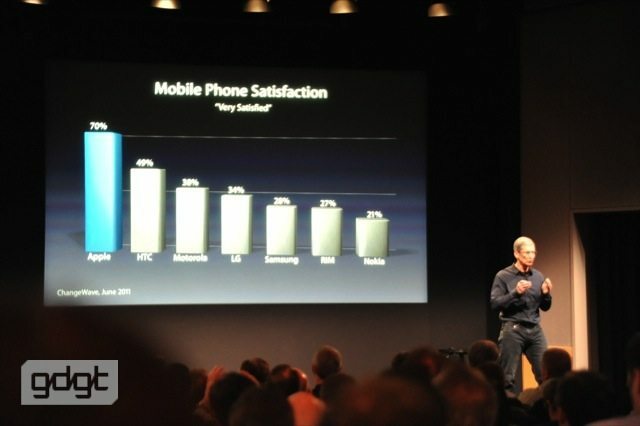 Today Tim Cook gave a conference about the new iPhone 4S and iPods, iOS 5, iCloud, iPhone 4S, and Siri. Good morning, this is my first product launch since being named CEO.It is a pleasure to host you today. I love Apple. In particular, I want to welcome you to this room, that we call our Town Hall. This room has quite a history at Apple. Just ten years ago we launched the original iPod here. China Apple Store: This is Apple’s largest store in Asia, and it set a record by welcoming 100k visitors on opening weekend. Apple thought they’d done well by welcoming 100k visitors in LA in the course of one month. Hong Kong Apple Store: Apple sold more Macs on opening day in this store than they had in any store in the world. Mac Os Lion: For the first time Apple has offered Mac OS as a digital download. The results are staggering, Lion has been downloaded 6 million times. It took Windows 7 20 weeks to reach what it took Lion 2 weeks to get to in terms of install base. MacBook Air: The customers love it, and the competitors are trying to copy it. The MacBook Air is just a portion of Apple’s entire lineup of Macs. MacBook Pro and iMac: Both are the #1 best selling notebook and desktop in the US. This momentum is not just limited to a mode. The Mac outgrew the PC market by almost 6x. Every single quarter for 5 years the Mac has outgrown the PC market. Apple is now approaching 60 million users. In US retail Macs are now selling in about 1/4 PCs in the store. iPod: Across the last ten years the iPod became the number one music player in the world. And in the US the market share has been above 70% for a very long time. Over that period of time Apple has cumulatively sold 300,000,000 of iPods around the world. To put that in context, it took Sony 30 years to sell 230,000 of Walkman cassette players. The MP3 market is a mature market, and the iPod is still a large and important market for Apple. 45 million iPods have been sold in the last year ending in June. Almost half of those are going to people buying their first iPod. iTunes: It started 8 years ago, Apple had 200,000 songs in our music library. It now has 100x that many: 20,000,000 songs. iTunes is the #1 music store in the world, with over 16 billions song downloads. iPad: iPads passed a quarter billion unit sales mark. Apple believes iPads can change the way teachers teach and kids learn. Pilots are replacing 40 pound flight bags with iPads, making pilots more efficient, and planes more fuel efficient. iPad in medicine: 80% of the top hospitals in the US are now testing or piloting the iPad. Companies: 92% of Fortune 500 are testing or deploying iPad. This is in less than 18 months. App Store: There are more than 500,000 apps in the App Store. More than 140,000 of these are made specifically for the iPad. All of these together makes the App Store the number one store for downloading apps. Customers have downloaded more than 18 Billion apps. And it’s accelerating. They’re downloading them at a clip of more than 1 billion per month. Apple has paid developers more than $3 Billions.